Gosh, it's been a while...mostly because something has been messing around with my access to blogger and keeps sending up a page that interrupts me whenever I've tried to post. I think it's something to do with Virgin having "updated" whatever it is that they update and my system doesn't seem to support everything as it did before. Gggggrrrr! It's also been a really busy time here one way and another....Stitches trade show was as manic as ever - even more so this year, as I was working on both the Personal Impressions and Deco Art stands. Here are some images from the show. The Deco Art stand and the make n take area that myself and Mark Gould were manning. I was adorning T Shirts with Andy Skinner's latest stencils and So Soft paints. One of my hand painted samples using the So Soft paints. A Mixed Media hanger...I wanted to do something with a more Summery feel. There's always time for some fun however busy we are of course! My new stamps were previewed at the show but, due to the pre production sets not being ready, I haven't been able to make any samples to share with you as yet. You can check out the new sets here though and they will be hitting the shops from around the 15th March...fingers crossed! I'm happy to say that I'm now on the Deco Art International Design Team which is really exciting. 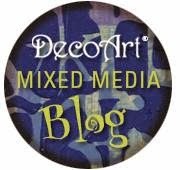 My first step by step project on the Mixed Media Blog can be seen here and there is a new button in my left sidebar which will take you straight to the general Mixed Media Blog. I've also been really busy with Church of course...lots of special services lately, including Ash Wednesday and St Chad's day. I was in Chorley on Wednesday for a full day's seminar on courses that we'll be running in the Summer so that was very interesting - if a little long! My garden is looking extremely neglected...probably because it has been! I am just waiting for the weather to warm up so that I can get out there and hack through the jungle of weeds, clean out the micro pond and mow the lawn at last. Thomas and Tara are beginning to spend a little more time outside again and I can tell that Spring is approaching by the fact that I am finding cat hairs attached to my clothing again..the moult has started! I've also decided to start running small (very small!) Mixed Media workshops from my little studio here.I can only take up to three people per session and these will be full days priced at £50 per person which includes all materials, refreshments, including lunch, and a goody bag of papers, ribbons, die cuts etc to take home. You can check out the first dates in my demo/workshop list on the left or you can request a specific date and I will try to fit it in for you. Right, I will crack on as I have a large amount of dies to cut in preparation for tomorrow's workshop at Craft Range in Burnley! Love the workshop idea...especially with so few people...great opportunity to learn;) If I could I would! Huge Congratulations Lindsay on your new International Designer Post for DecoArt, so good to see you on board. Off to see your first project! I got some of the Ink Effects but have been told they are no longer stocking this item so it looks like it's going to be the So Soft paint for fabric on my next order. Loving the pictures of the t-shirts and bags making me want to create some of my own! Thanks for the comments everyone! Getting a little bit done in the garden now the weather's improving - it's going to take ages though! Yes, look forward to seeing you in May Aly. Ink Effects are no longer being stocked as you say, but So Soft paints are so versatile that I can't recommend them highly enough.